Dallas Cowboys Stadium is the state of the art home to one of the most popular sports franchises in the world. Going to a game or a concert is fun, but wouldn’t it be interesting to go on a Dallas Cowboys Stadium tour and learn more about the stadium and see parts that the general public doesn’t usually get to see? You may be wondering if one of the Cowboys Stadium tours are worth it, especially if you are not into sports. 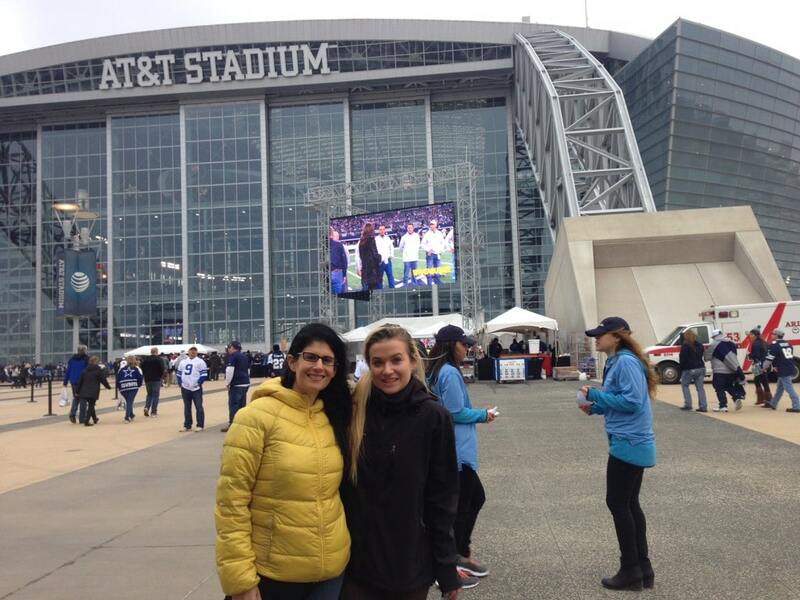 Read my detailed Dallas Cowboy Stadium tour review and find out what to expect. I think you will enjoy the behind the scenes tour even if you are not a football or Cowboys fan. Even though I now live in New York City, I am still a Dallas Cowboys fan (and always will be). I will go out of my way to see the Cowboys play, including the time I went to Wembley Stadium. Growing up in Dallas, I have fond memories of going to the old Texas Stadium and watching Troy Aikman, Michael Irvin, and Emmitt Smith. Texas Stadium was special, it had a hole in the roof so God could watch America’s Team play. Well, at least that’s what some used to say. But the time came when the old Cowboy Stadium needed an upgrade. Jerry Jones wanted to host the Superbowl and the NFL wouldn’t allow it without a domed stadium. Ironically, the week the Cowboys did host the Superbowl in 2011 it was icy and cold. Why the NFL let the Giants host a Superbowl in their stadium, I can’t explain, luckily the snowstorm hit the day after. Anyway, Jerry Jones jumped through some hoops and built a new stadium in Arlington, a suburb between Dallas and Fort Worth, right next to the Texas Rangers Stadium. Jerry Jones went all out in the design of the stadium. The stadium is very impressive and a tourist attraction in its own right, even without a game going on. It surprised me that people came from all over the country to visit Dallas Cowboys Stadium, also known as AT&T Stadium. Some weren’t even Cowboy fans! It’s the fourth largest stadium in the NFL by seating capacity. It can hold 80,000 fans. Technically, the stadium can hold 105,000 fans including the standing room areas, but the record attendance for an NFL game was 105,121 in 2009. The high definition video screen that runs from 20-yard line to 20-yard line is the 29th largest in the world. There are also more than 3,000 Sony LCD displays throughout the stadium so fans never miss a minute of the action. In addition to being the home of the Dallas Cowboys, it also hosts the Cotton Bowl Classic and the Big 12 Championship Game. My mom (who is not a football fan) agreed to take me to tour the Dallas Cowboys Stadium. VIP Guided Tours and Self-Guided Tours run daily with the exception of some blackout dates. The first tour in the morning is at 10:00 am and tours of Cowboy stadium run until 4:30 pm. On some days, they do also offer a tour that focuses on the museum-quality art that is inside the stadium. The Jones family commissioned 18 contemporary artists to create artwork for the stadium. I do recommend that you buy your tickets online here in advance as all the tours of Cowboys Stadium do sell out. When we went, we did the VIP guided tour and we had to wait about 45 minutes because earlier tours were already sold out. We passed the time looking around the Dallas Cowboy Store. The Dallas Pro Shop has a lot of Dallas Cowboys merchandise, but it is pretty expensive so I didn’t buy anything. I have found it is better (i.e. cheaper) to shop Dallas Cowboys gear online on Amazon. The video board was the largest in the world at the time the stadium opened, and when they have basketball games the screen is bigger than the court. The retractable end zone doors are the largest in the world, and the retractable roof weighs about the same as 92 Boeing 777s and can open or close in 12 minutes. The stadium cost $1.15 billion to build, almost double the original estimate and Jerry Jones covered the overrun. Even a non-sports fan has to appreciate that the stadium is an engineering feat! Jerry (and his wife) put their heart and souls into making the stadium something special. The first part of the Dallas Cowboys Stadium tour we explored the main seating area, the luxury suites, and the bars that are for standing room only tickets. It was so special to go inside a Dallas Cowboys luxury suite and imagine watching a Cowboys game from one. Last season, my niece and I went to a game with standing room only tickets because tickets for actual seats were too expensive. We had a great time, it was nice to feel the atmosphere of the game even if we had to watch a tv screen to get a good view of the game. For sold out games, check out StubHub for tickets. StubHub backs every order so you can buy and sell tickets with 100% confidence. After that, we went down to the floor level. We got to visit the Dallas Cowboys and the Cowboys Cheerleaders locker rooms. I didn’t even know the cheerleaders had locker rooms! They had a couple of jerseys that you could use to take photos inside the Dallas Cowboys locker room. 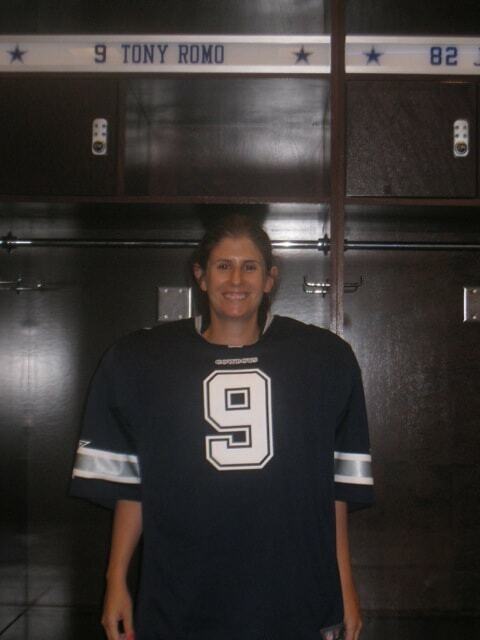 I chose to take a photo at Tony Romo’s locker! We also saw the field level bar that the Cowboys run through to enter the field. I had seen it on TV so many times, so it was a bit surreal to be there myself. The Cowboys Stadium also has luxury suites that are field level. I thought that these were pretty clever design features. We also saw the media room, where the Cowboys hold their postgame press conferences. It was fun to pretend to be Jason Garrett. 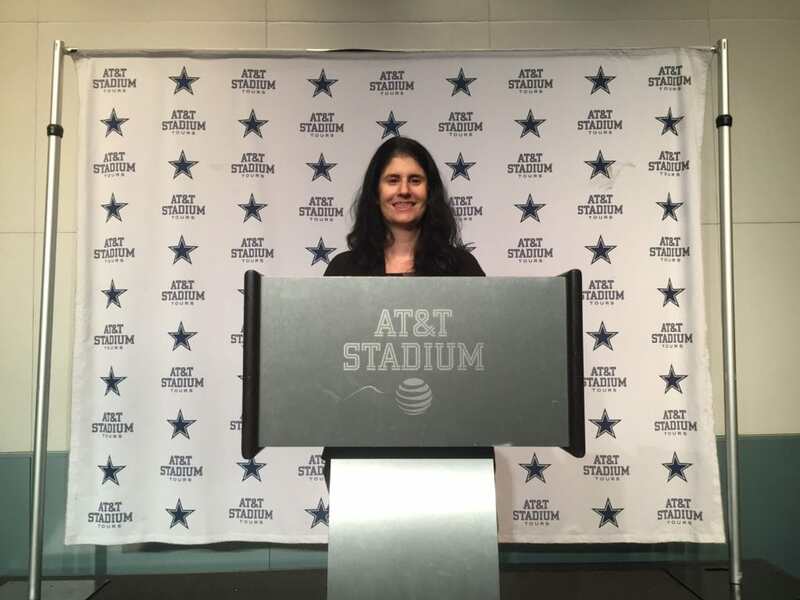 Anisa at the podium in the Cowboys Press Room. The final stop on the Cowboy Stadium tour is the field and you can enjoy it as long as you like. The Dallas Cowboys self-guided tour also gets you access to the field. Some kids brought footballs and were playing around on the field. 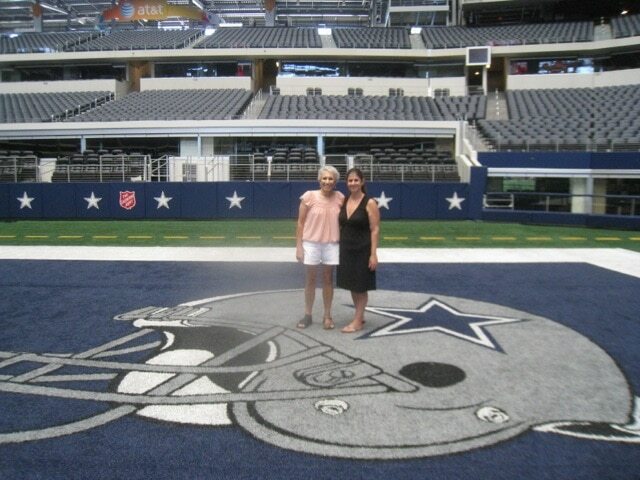 We just took pictures in the Cowboys end zone and by the star at midfield. I thoroughly enjoyed the tour inside Cowboys Stadium. It was worth the wait. I learned a lot and the access we got was better than I expected. Plus, I got pictures of myself on the Dallas Cowboys field. So for all you Dallas Cowboys fans out there and anyone interested in engineering or architecture, I encourage you to take the Dallas Cowboys tour. Note: I actually did this tour again so that Russell could visit the stadium too. Dallas Cowboys Stadium is located in Arlington, Texas, which is between Dallas and Fort Worth. Unfortunately, there is no public transportation that will take you directly to the stadium, so it is best to drive. Use GPS to find the best route from your location to the Stadium. The address is 1 AT&T Way. The closest freeways are Interstate 30 and Highway 360. Cowboy Stadium parking is free in Blue Lot 1 or 2 on the days that tours are available. Have you gone on one of the Cowboys Stadium tours or ever done a tour of another stadium? I would love to hear about your experience. Buy your Dallas Cowboys Stadium Tour tickets in advance as the tours do sell out. If you like, bring a football on the Dallas Stadium tour and you can play on the Cowboys field. Don’t forget your camera, there are lots of fun photo opportunities. If you need more Dallas Cowboys gear, check out the options on Amazon. It will be cheaper than the Cowboys Stadium Pro Shop.